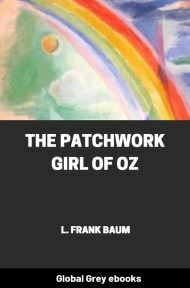 This is the thirteenth book in The Oz Series by L. Frank Baum. The mischievous boy Kiki Aru has discovered a magical word – Pyrzqxgl – that can transform him and anyone else into whatever Kiki demands. Worse yet, Kiki has been recruited by the villainous Nome King in his latest attempt to get revenge on Princess Ozma and all her friends. There was only one thing that grieved him. He had discovered a new and secret method of transformations that was unknown to any other Sorcerer. Glinda the Good did not know it, nor did the little Wizard of Oz, nor Dr. Pipt nor old Mombi, nor anyone else who dealt in magic arts. It was Bini Aru's own secret. By its means, it was the simplest thing in the world to transform anyone into beast, bird or fish, or anything else, and back again, once you know how to pronounce the mystical word: "Pyrzqxgl." Bini Aru had used this secret many times, but not to cause evil or suffering to others. When he had wandered far from home and was hungry, he would say: "I want to become a cow—Pyrzqxgl!" In an instant he would be a cow, and then he would eat grass and satisfy his hunger. All beasts and birds can talk in the Land of Oz, so when the cow was no longer hungry, it would say: "I want to be Bini Aru again: Pyrzqxgl!" and the magic word, properly pronounced, would instantly restore him to his proper form. Now, of course, I would not dare to write down this magic word so plainly if I thought my readers would pronounce it properly and so be able to transform themselves and others, but it is a fact that no one in all the world except Bini Aru, had ever (up to the time this story begins) been able to pronounce "Pyrzqxgl!" the right way, so I think it is safe to give it to you. It might be well, however, in reading this story aloud, to be careful not to pronounce Pyrzqxgl the proper way, and thus avoid all danger of the secret being able to work mischief. Bini Aru, having discovered the secret of instant transformation, which required no tools or powders or other chemicals or herbs and always worked perfectly, was reluctant to have such a wonderful discovery entirely unknown or lost to all human knowledge. 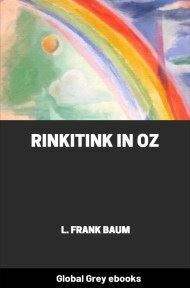 He decided not to use it again, since Ozma had forbidden him to do so, but he reflected that Ozma was a girl and some time might change her mind and allow her subjects to practice magic, in which case Bini Aru could again transform himself and others at will,—unless, of course, he forgot how to pronounce Pyrzqxgl in the meantime. After giving the matter careful thought, he decided to write the word, and how it should be pronounced, in some secret place, so that he could find it after many years, but where no one else could ever find it. That was a clever idea, but what bothered the old Sorcerer was to find a secret place. He wandered all over the Saucer at the top of Mount Munch, but found no place in which to write the secret word where others might not be likely to stumble upon it. So finally he decided it must be written somewhere in his own house. Bini Aru had a wife named Mopsi Aru who was famous for making fine huckleberry pies, and he had a son named Kiki Aru who was not famous at all. He was noted as being cross and disagreeable because he was not happy, and he was not happy because he wanted to go down the mountain and visit the big world below and his father would not let him. No one paid any attention to Kiki Aru, because he didn't amount to anything, anyway. Once a year there was a festival on Mount Munch which all the Hyups attended. It was held in the center of the saucer-shaped country, and the day was given over to feasting and merry-making. The young folks danced and sang songs; the women spread the tables with good things to eat, and the men played on musical instruments and told fairy tales. Kiki Aru usually went to these festivals with his parents, and then sat sullenly outside the circle and would not dance or sing or even talk to the other young people. So the festival did not make him any happier than other days, and this time he told Bini Aru and Mopsi Aru that he would not go. He would rather stay at home and be unhappy all by himself, he said, and so they gladly let him stay.